To celebrate Pro Bono Week we’ll be featuring a series of interviews with recent graduates to hear about their voluntary work stories. In this Q&A we caught up with Bethane Harland (LLB 2018), former Student Director of the University of Bristol Law Clinic. She spoke to us about the challenges and rewards of her voluntary work, how it has influenced her aspirations, and the advice she would give to students embarking on their pro bono work journey. After looking at a range of universities across the country, Bristol stood out to me. I lived in Brighton all my life, and so moving to a city with a similar community atmosphere and inclusiveness, yet bustling metropolitan lifestyle appealed to me. The Law School is also renowned for its quality education and highly-regarded current and emeritus legal academics. 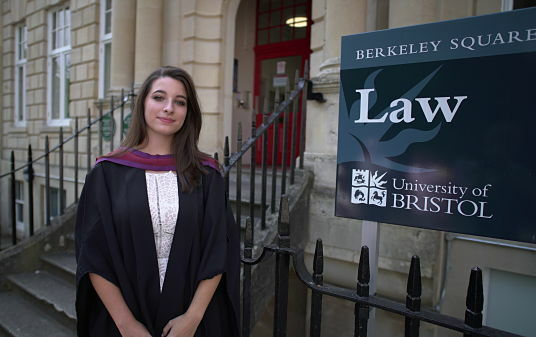 I knew that if I wanted an excellent legal education to boost my career, taking up my offer from Bristol would be the best first step in pursuing my goals. The Law Clinic also grabbed my attention when I visited on the Post Offer-Holder Day. In fact, I still have the leaflet I was given that day! I've always taken part in community work, and so I saw this as a unique opportunity to act as a legal lifeline for some of the most vulnerable people at the most desperate times of their lives. What could be more rewarding than that? Pinpointing just one highlight is difficult. I was selected as a Student Adviser for the Law Clinic in my first year and as Advice Coordinator on the Student Committee in my second. Being the main point of contact between Student Advisers, the Committee and the staff, I felt a great sense of responsibility to ensure cases were allocated and worked on as quickly as possible to ensure a just outcome for each client. While strenuous, the sense of fulfilment I felt from effectively managing that vital role made it all worthwhile. Working as Student Director in my final year was one of the most challenging, yet rewarding tasks I have ever carried out. As well as being able to influence elements such as redesigning the Clinic logo and new hoodies, and re-formatting the Student Handbook, I also got to plan and lead important meetings with our sponsor Osborne Clarke, re-mould and schedule student training with the firm, and implement my vision for the Clinic with the guidance of Clinic staff. I planned and presented numerous events, spoke on BBC Radio Bristol about Clinic development, and met many others from different organisations dedicating their lives to community and pro bono work. Managing 16 committee members and 160 Student Advisers was a challenge, but I learned enormously from it and would do it all again in a heartbeat – even if doing so on top of the most stressful year of my degree did lead to many sleepless nights and momentary tears! Founding the Clinic’s partnership with Bristol Mind was also a high point for me. I realised that the Clinic partnered with organisations to help those suffering from drugs dilemmas and physical illness, yet not specifically mental illness. To fill this gap, I contacted and built up a partnership with Bristol Mind. Involving numerous meetings and hard work throughout the year, I saw this as an extremely important opportunity to fulfil the ‘holistic lawyering’ gap within the Clinic; while many from Mind have been referred to us for help with legal problems, if we feel any of our other clients need mental health support, there is now a direct route through which they can be referred to Mind. Forming this partnership in order to help others is something I will always be proud of. Apart from committee highlights, the gratification I got from working with clients as a Student Adviser culminated in my final case. Lasting my entire final year, I advised a desperate client caught up in a benefits fraud allegation, valuing over £50,000. Being there to listen to her, explore and explain her options with her, and ultimately help her come to a reasoned decision about her next step was all she had needed for a long time. Her emotional thanks to us for helping her reinforced the reason I carried out all of the hard work on top of my degree, and has instilled in me a sense of responsibility to continue pro bono work going forward. Balancing the above-mentioned Clinic work with endless work for my degree as well as my other commitments was certainly a difficult feat. However, working with the Clinic was something I knew I wanted to do, and so the challenge only inspired me to work harder. At times, the realities of the reason for Clinic work and the desperation of the clients’ situations can become harrowing and difficult to contemplate emotionally. I certainly became more frustrated and upset at the state of the legal sector following the 2012 Jackson reforms, the distress of many of our clients reflecting the harsh realities. Yet instead of dwelling, I saw this as a chance to fill the legal aid void which had been formed. My Clinic experiences have definitely prepared me well for the workplace. Throughout my numerous roles my confidence developed significantly, my organisation and time-management had to become flawless, and my determination to succeed and complete everything I do to the best of my abilities is ruthless. I also gained a lot of practical legal knowledge, including learning about specific forms, court procedures and applying legal tests – incredibly valuable knowledge for a budding young lawyer! While I always knew that I wanted to take my career into the social welfare legal sector, my voluntary work solidified this interest for me. As well as volunteering with various pro bono bodies, I’m planning on pursuing a career as a solicitor/ barrister (most probably both!) in mainly family, criminal and/or human rights law, amongst other areas dedicated to helping everyday individuals. You have recently started volunteering at Citizens Advice in Brighton and been offered an advice role at Liberty in London – congratulations! What will the work entail? Thank you! At Citizens Advice, following months of rigorous training, I recently began my role as a Gateway Assessor. Currently based on the telephone, I am the first point of contact for clients, who call to get help with any legal issue. It is my job to decide their next best step: whether this is giving them information on the day, booking them an advice appointment, or signposting them to a more suitable organisation. The sense of gratification I get from this role matches that of the Clinic, as I am continuing to act as a lifeline for so many people with nowhere else to turn. At Liberty I volunteer with the Advice and Information team. We’re each allocated separate enquiries which come in, and are tasked with drafting responses to them generally within 2 weeks. Issues are complex and can require a vast amount of legal research before answers become clear. However, I get to do this with the knowledge that I am educating people on their rights, sometimes following the most severe breaches of civil liberties. Again, it is hard to think of anything more rewarding. Work hard. Whether in the capacity of a Student Adviser, through involvement with outreach work, or as a Committee member – each and every role within the Clinic helps to make the entire body work effectively as a whole, and without your hard work, the Clinic would not be able to function. It might be hard to manage against your studies at first, but the Clinic provides support to all students to enable them to build upon their skills and manage the load over time. Strive to grasp hold of every opportunity that the Clinic offers. I have not even begun to list all of the skills I acquired throughout my various roles within the Clinic, but it is the knowledge and abilities I gained through taking part in diverse projects which is helping me to progress through the early stages of my legal career a lot more seamlessly. Finally, do not forget this: value your clients and learn from them. While all my clients were very different and faced different issues, I learned something from each of them. Through listening and respecting their struggles, as well as learning about how to manage various legal issues, I developed my practice on an emotional and interpersonal level. When learning about the rigid structures of the law it can be easy to forget that the black-letter content dictating all of our lives affects every day people in different yet significant ways. Lawyers are commonly painted as hard-faced, privileged individuals a mile apart from those who need help. Yet lawyers owe their jobs to the difficulties people face, and so as a profession we all need to empathise with others to best help them as individuals.